It'll come fully boxed, with booklets, CD, standard 18-55mm lens, charger, 2 batteries, 512MB memory card, and anything else that is supposed to come with the camera like tv lead, etc. The LCD on the camera also has the protective film applied. The outside of the camera is as new, no marks or scratches. All in perfect working order. Also has the Russian Firmware hack done allowing more menu options including ISO3200 (useful for framing) and RAW+JPEG. The important bit: It has the Baader ACF filter fitted to replace the standard Canon one. Autofocus works 100%, and colour balance can be corrected with a)Astronomik insert filter or b)custom wb or c)in photoshop. I've used the camera for 2 years, all the photos of mine on here were all taken with this camera. I did the filter mod myself, so you can be assured it is of the highest quality. There is one dust bunny right middle of screen, removed with flats. I've never attempted to clear the sensor as overall the sensor is clear apart from this one small dot. I'm sure it could easily be cleaned by anyone who buys it. Also included is the dummy battery that allows the camera to run via 12v (never runs out !). 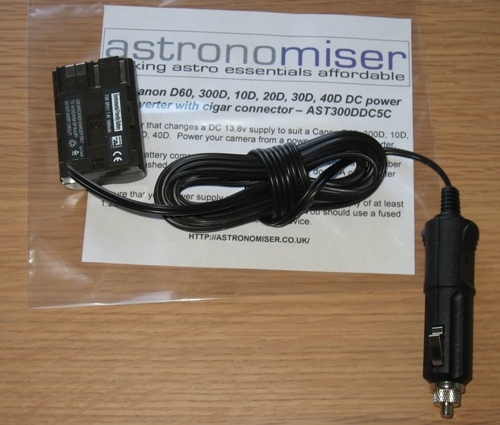 This was bought from astronomiser, costing Â£25. I would like Â£200 for the lot.